Hope those of you here in the United States enjoyed a wonderful long weekend. I know we did…but it goes by so fast! This week’s meal plan is somewhat short, and not quite as organized as usual. We’re eating a lot of what’s already on hand – we have some meat in the freezer, a lot of swiss chard that I pulled from the garden today, and the pantry holds quite a few goodies. In addition, we have activities that aren’t allowing for much in the way of dinner preparation time. So while I’ve written down a few things, it’s mostly a chance for me to wing it a bit. Alright, I’ve kept you long enough. 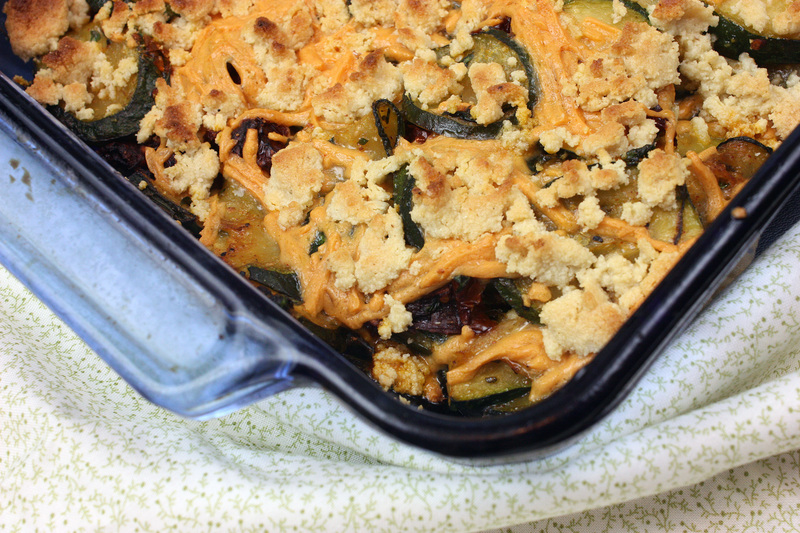 Here’s the zucchini and sun-dried tomato casserole! Preheat the oven to 350 degrees. Grease a casserole dish and set aside. Heat a skillet to medium heat. Add olive oil and swirl to coat. Saute zucchini for about 8-10 minutes, or until softened. Add herbs and sun-dried tomatoes and continue to sauté for another minute. Season with salt and pepper to taste. Using a paper towel, squeeze the excess juice from the vegetables (otherwise, you’ll end up with a wetter casserole than you desire) Transfer the vegetables to the casserole dish. Top with Daiya cheese. This meal plan post is linked to Gluten-Free Menu Swap over at Celiacs In The House. This post is linked to Slightly Indulgent Tuesdays at Simply Sugar and Gluten Free. That looks great (and I’m totally going to try out your Shepherd’s pie recipe). My kids (who are only 3 and 4) are down to only liking a handful of recipes so I think it’s time to mix things up. In my opinion, you just can’t go wrong with zucchini and tomatoes. This looks great. Yummy, love the flavor combos of the squash casserole! Kim – how do you make your own sun dried tomatoes? Would love the recipe to use the tomatoes in the garden! Both of your casserole recipes sound fantastic! That whole menu you listed is just full of healthy, inspiring ideas. It looks like you love to cook with fresh veggies and herbs. Are you a fan of Spiceman’s FM 1410 garden in Dallas? Artizone, you know, I’ve heard so many good things about Spiceman’s FM 1410, and have never been there. It’s kind of out of my way – I usually visit the Chestnut Square Market in McKinney. I have the hardest time finding fresh sage! This recipe looks delish though!! Sorry the pancakes weren’t a hit. I find there are lots of grain recipes I love that my hubby isn’t as fond of! thehealthyapron – wish you lived near me, because my sage is overtaking my garden! I just cut a BUNCH (like enough to fill a large mixing bowl) and dried it so I could keep the overgrowth down. It’s lovely though! This is a great recipe to save for the upcoming season for summer squash. This looks delicious! Alta, we actually deliver fresh food from Dallas artisans like Spiceman’s FM 1410. If you’re interested in tasting his produce, see if your home or office is in our delivery area ZIP code list at http://www.artizone.com/Zone/Help/FAQ#where. If not, I’d be happy to put in a request for your ZIP code to be in the next expansion area. I have not had a casserole in soooooooo long. I just might have to crack open some Daiya for this! Got a recipe that makes you famous? The Dallas Observer, along with Taste of Dallas, wants to make YOU a culinary master for a day! Send us your most inventive recipe & photo of the dish to blueribbonrecipe@dallasobserver.com to enter The City of Ate Blue Ribbon Recipe Contest. Hurry, deadline for submissions is June 10th!